FILE - Uighurs living in Turkey and Turkish supporters, chant slogans before burning a Chinese flag, July 5, 2015. Since 2013, thousands of Uighurs, a Turkic-speaking Muslim minority from western China, have traveled to Syria to train and fight alongside al Qaida. At the peak of the Syrian conflict in 2013, there reportedly were an estimated 3,000 TIP fighters across the country, mainly in Idlib, Aleppo, Hama, Homs and the northern part of Latakia province. Their numbers, however, have significantly declined because of major military advances by the Syrian regime troops, backed by Russia and Iran. WATCH: What Is the Turkistan Islamic Party? Kinno said the TIP has been largely inspired ideologically by jihadi networks like al-Qaida and the Taliban. The group has claimed responsibility for several attacks against Syrian troops and their allies, including a 2016 attack in Khan Touman in Idlib, where dozens of Iranian soldiers and militiamen were killed. In late 2017, Syrian regime officials said they had discussed with Chinese officials the possibility of deploying Chinese Special Forces to Syria to counter the threat of the TIP. China, however, has not publicly discussed such a deployment. Beijing considers TIP a terrorist organization. In August of this year, a pro-regime Syrian newspaper, al Watan, reported that China’s ambassador to Damascus had expressed Beijing’s readiness to join the Idlib operation to back the Syrian regime against rebels, one month before Russia and Turkey agreed on a cease-fire there. By targeting the regime of Syrian President Bashar al-Assad, the TIP fighters “think they’re fighting China, because China is an ally of Assad,” researcher al Tamimi said. 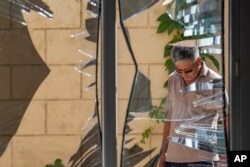 FILE - A Chinese Embassy employee examines broken windows, Aug. 30, 2016, after a suicide bombing in Bishkek, Kyrgyzstan. The bombing highlighted the threat of an ethnic Uighur militant group and the growing Chinese involvement in Syria and Afghanistan to combat it. Along with Russia, China repeatedly has vetoed U.N. Security Council resolutions aimed at condemning Syrian government actions against civilians in Syria. Syyed Mohammad Hadi, a Tehran-based analyst, says there are two explanations for why Chinese troops might be involved in Syria. “From a security viewpoint, China will pursue its objectives of targeting trained and experienced fighters in Syria and preventing them from potentially transferring those fighting skills to their counterparts in the west of China,” Hadi told VOA. With Syria’s military continuing to make advances, analysts assert that the fate of Uighur fighters in Idlib and elsewhere in Syria depends on whether Turkey can crack down on such jihadi groups.